The year 1994 heralded the acquisition of Bairds of Annan, and the agricultural divisions from County Motors by Carrs Agriculture. The following year was significant due to the opening of the brand-new Penrith machinery branch after a six-month build, on the Haweswater Road Industrial Estate. 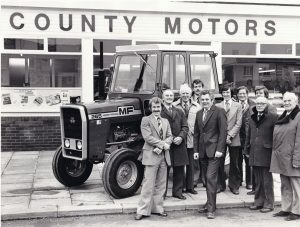 Carrs Agriculture were official dealers of Massey Ferguson tractors and combines. The branch at Penrith has remained in the same location in the heart of Cumbria, but the Annan business moved to its purpose-built country store with showroom and workshop in 2014. The company expanded it’s operations, and now distributes and services Massey Ferguson machinery from six depots in Cumbria, Northumberland, County Durham and Dumfriesshire. It took six months to build the current site at Penrith, and opened in 1995.
the 3000 series and 3600. Massey Ferguson had been the leading tractor brand in the UK for over 30 years, with machines being manufactured and assembled in Coventry. 1994 also witnessed a change for the brand with it’s acquisition by AGCO, marking a commitment to become a leading manufacturer of quality agricultural machinery that stands true today as much as it did 25 years ago. 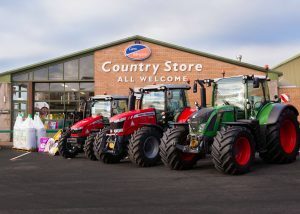 During 2019 Carrs Billington will be celebrating 25 years with this iconic farming brand with limited edition anniversary tractors, special offers on selected models and special bespoke merchandise. Carrs Billington will also be hosting a celebration event, remembering machines from the past 25 years. Look for details in local press and on social media.